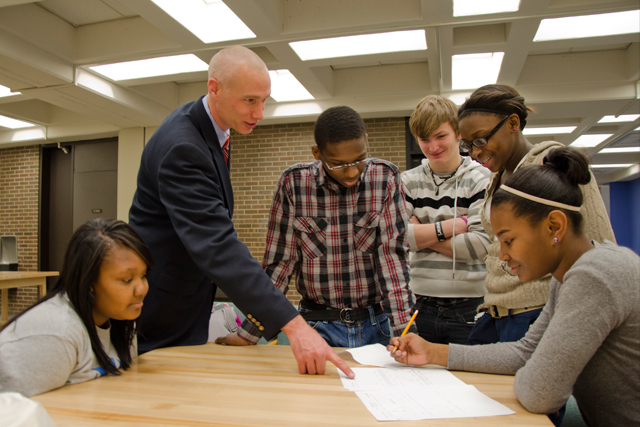 When Jeffrey McClellan left Lima City Schools to become the Founding Head of MC2 STEM High School in Ohio’s second-largest school district, he committed himself not only to serving one of the nation’s most underserved populations of students, but also to opening the large urban school district’s first innovative, project-based STEM High School. As Founding Head of MC2STEM High School in the Cleveland Metropolitan School District, Dr. McClellan has stretched the boundaries of STEM education in the 21st Century. MC2 STEM high school spans the city of Cleveland, with 9th-grade classrooms at the Great Lakes Science Center and 10th graders on GE’s Nela Park Campus, making it the nation’s only high school on the headquarters campus of a Fortune 500 company. 11th and 12th-graders moved this year to their new location on the campus of Cleveland State University. Students at MC2 STEM High School participate in a year round, project based curriculum that is supported by many members of the professional STEM Community of Greater Cleveland. This experience prepares the students for internships within the Greater Cleveland Community and participation in college classes before they graduate from high school. Among other innovative features of the school, MC2 STEM High School is noted as the first High School in the United States to house a M.I.T. FAB Lab. MC2 STEM High School currently houses a Fab Lab at each site and has a Mobile Fab Lab that it uses to support the spread of Fab Lab experiences to other schools and communities around the country. It’s no wonder that the White House webcast of President Barack Obama’s 2014 State of the Union Address flashed, “We need more schools like Cleveland’s MC2STEM High School,” as the President talked about the need for 21st Century, innovative learning environments in the nation’s schools. MC2 STEM High School has been recognized by Edutopia in their series “Schools That Work” and has been named one of America’s Best Urban High Schools by National Center for Urban School Transformation. The replication of components of the MC2 STEM High School model has happened as far away as Egypt where Dr. McClellan works as a member of an international team creating public STEM High Schools in Egypt. This was by far one of my favorite talks of the afternoon!